Large Luxury Lake Front Condo on Lake Hamilton! Spring & Summer book up fast! Lakefront on Lake Hamilton! Gorgeous views from master bedroom and living area! Large 2 Bedroom 2 Bath Luxury Condo Right on Lake Hamilton and in the BEST location in Hot Springs in the Hwy 7 area on Grand Isle!! This beautiful condo was renovated in October 2017. 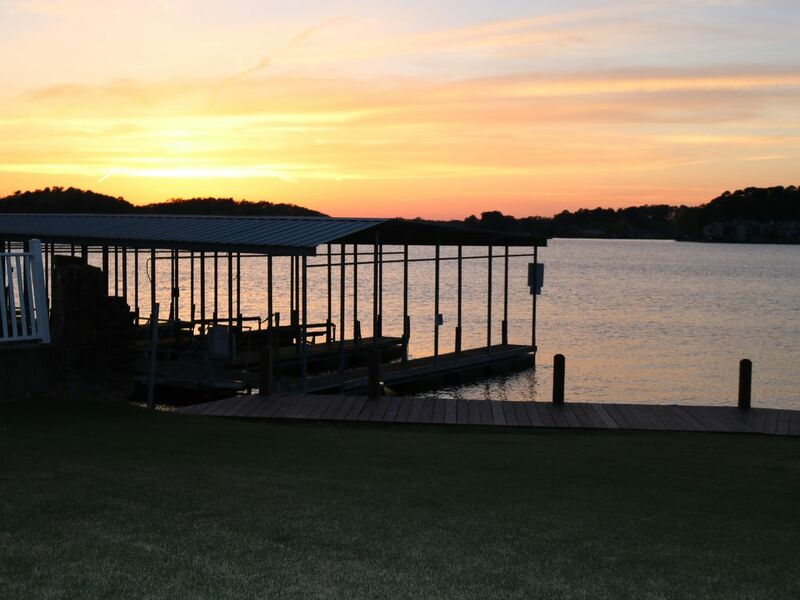 It is located in the Catalina Cove Complex which is directly off Highway 7 and on the main channel of Lake Hamilton right across from Fisherman's Wharf Restaurant! It is very easy to find and close to most Hot Springs attractions including Oaklawn Race Track! Short walking, driving or boating distance to many restaurants, marinas, shopping, nightlife, etc. This condo is on ground level with direct access to the lake and a boat slip right off the porch. The boat slip is for day use; however, boat slips may be rented for overnight use at the Marina which is adjacent to the complex. Bring your own boat or one can be rented at the Marina. The condominium is approximately 1500 square feet with an open floor plan, showcasing a spacious kitchen and living area with spectacular lake views and incredible sunsets. The living room has a welcoming electric fireplace and a flat screen television with DVD for your enjoyment. The kitchen is equipped with modern appliances including microwave, dishwasher, stove, coffee maker as well as being fully equipped with all cookware, dishes and utensils. Guests can enjoy a beautiful wet bar with icemaker! There are two spacious bedrooms and two full baths. The master suite includes a king bed, flat screen television and access to the porch with beautiful views! The master bathroom has a whirlpool tub and separate walk in shower. The guest bedroom has one queen bed, Flat screen TV, private twin bunk beds, and a walk-in closet. You will find many extra touches to make your stay comfortable! Holiday fireworks can be enjoyed from the porch! Feel right at home in this spacious condo! Covered designated parking for one vehicle. There is only one guest parking area for a 2nd vehicle. Parking is limited. Offers great views of the lake! Full size with ice maker with a separate stand alone icemaker on the wet bar. Large Open Floorplan with garbage disposal and trash compactor. Flat screen televisions in living area, and both bedrooms. Direct TV and Free Wifi. Board Games! Many board games and cards! Wonderful back patio overlooking the lake! Location Location Location!! In the #1 highly sought after Hwy 7 area! We really loved our stay at this condo! It is perfectly decorated and comfortable. It is very conveniently located to both the lake and hot spots to visit. The only concerns to be aware of are if there is a large group above you, it can be a bit loud and the drive down to the condo is straight down. I would not attempt the descent or ascent in icy or snowy weather. Clean and well decorated. Quiet. Just the get away we were looking for. We would be repeat customers! We enjoyed our stay. Very clean and updated amenities. Very clean and updated amenities. Very clean, well laid out, great location central to everything. Every detail well though out. Great layout. So clean. We had a wonderful stay and the condo met our needs very well. The parking spot was small and guests from another condo kept parking in the middle of the two spots so I couldn’t get in but he was very friendly when he realized I needed to be able to park in that spot. More signage or painted lines may be helpful to direct people a little more. Close to everything on Grand Isle Hwy 7 Area! The number 1 area in Hot Springs! 4 Miles from Oaklawn Racing!